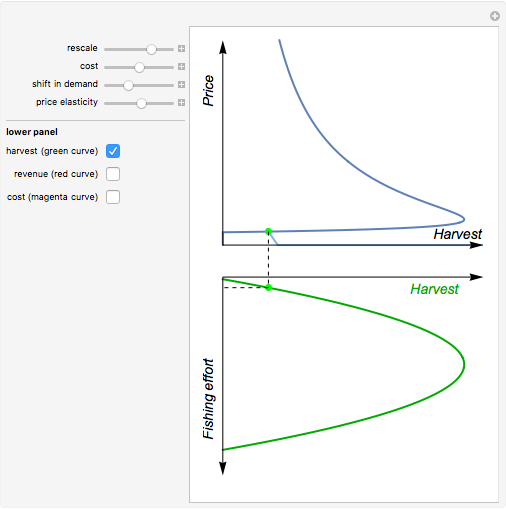 From bioeconomic theory it is well known that the long-term fish catch supply is normally described by a backward-bending supply curve (the blue curve in the upper figure of this Demonstration). 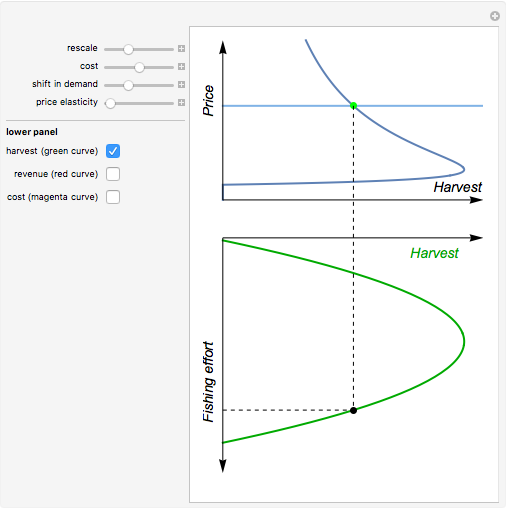 The shape of the supply curve reflects the bell-shaped growth curve of the stock biomass and the catch equation of the fishery; see the Gordon–Schaefer model shown by the green curve in the lower figure. Total revenue in equilibrium is found by multiplying the equilibrium catch (green curve) by the price function represented by the light blue demand curve of the upper figure. Total revenue is shown in the lower figure as a red curve. A linear cost equation is assumed, seen in the lower figure as a magenta-colored line. 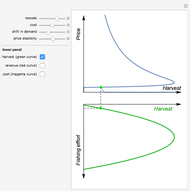 The intersection of the red revenue curve and the magenta cost curve represents the open access equilibrium of this fishery. 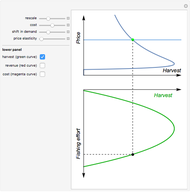 The connecting dashed line from this point to the green catch curve and the demand and supply curves in the upper figure gives the static solution of this parameter set. 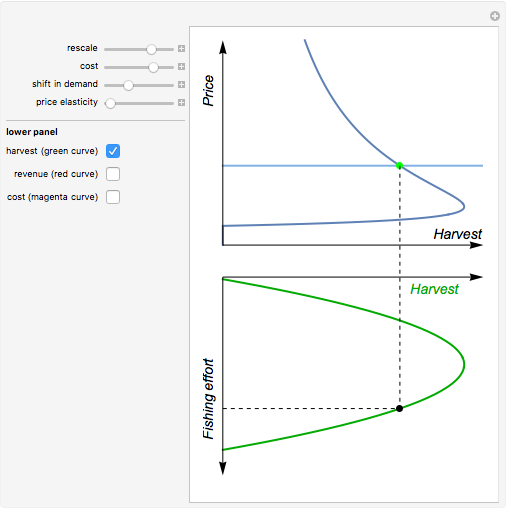 The supply curve reflects the equilibrium cost of producing a certain quantity of sustainable catch. When the cost does not include opportunity costs of labor and capital, the price on the supply curve represents bioeconomic (open access) equilibriums. 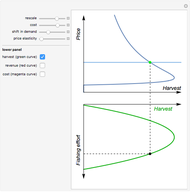 The backward-bending shape of the supply curve may cause several intersections with a down-sloping demand curve (the light blue curve in the upper figure). In the case of three intersections, one is unstable. Arne Eide "The Backward-Bending Supply Function in Fisheries"